Today, the final piece of Microsoft’s strategy slotted into place. They announced Windows Phone 8, their new OS for phones. It’ll still have that pretty tiled “Metro” interface, but to the consternation of those few people currently developing apps for Windows Phone 7, just about everything else is changed utterly. We’ll see why later. And that’s not even the most unexpected part of the new strategy. Yesterday they tore up the playbook and actually made a thing. Of course the software giant has done hardware before, almost from the start indeed. They produced their own mice to make sure the peripheral vital to Windows would be standardised and cheap. There was the highly successful Xbox, and the highly unsuccessful Zune. But this is the first time Microsoft has made their own… Laptop? Tablet? A little from column A and a little from column B. Microsoft have decided, reasonably I think, that somewhere between the tablet and the ultra-light notebook there’s a product waiting to happen. And they call it Surface. Which is a little confusing, because up till now Microsoft Surface was an intelligent multi-user tabletop wholly unrelated to this device (and now renamed PixelSense). Maybe they envisage integrating the two technologies at some future date, but really it seems they decided Surface was too cool a name for anything except their coolest product. The nerds. Even more confusingly, Surface comes in two versions. Both are slim 10.6″ tablets. Both have a light and attractive magnesium alloy chassis. Both have a neat kickstand that props it at a good viewing angle. Both can use intelligent covers that attach with magnets. Shades of the iPad’s Smart Cover perhaps, but these are also keyboards, instantly transforming tablet into laptop. They come in a thin touch version and a slightly thicker one with some key travel, and both can be used with either Surface model. So how then do they differ? In a word, fundamentally. The slightly more svelte of the two uses a RISC processor from ARM, like just about every tablet or smartphone on the market, and runs only “Metro” apps. It does have a desktop, but only as an environment for editing multiple documents with a built-in, touch-friendly version of Office. No conventional desktop software runs on this, so it is very much to the PC as the iPad is to the Mac. And much as the the iPad has a special, much-reduced version of OS X called iOS, so the Surface has Windows RT, a stripped-down variant so named because it only runs apps written for WinRT. That should make the confusion complete… I’ll go over this again because it’s going to come up a lot in the next few years and you won’t regret getting it straight now: Windows RT, Microsoft’s operating system for ARM processors, is called that because it only runs WinRT. So what the hell is WinRT? It’s the new Windows “runtime”, a programming environment providing simplified access to the hardware’s resources – memory, camera, sensors, network and so on. Apps are created to run in this environment. 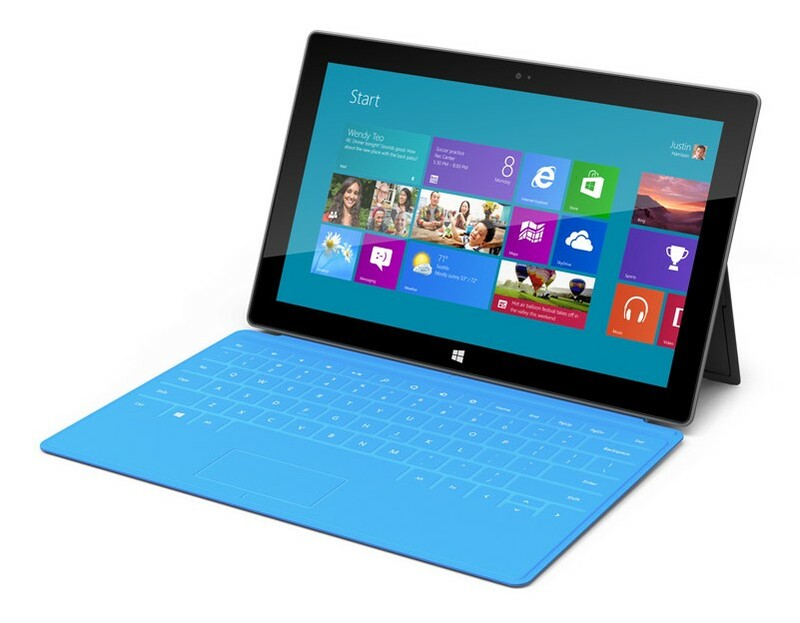 OK, what about the other model, sometimes referred to as Surface Pro? It looks very similar to the basic version. The only different dimension is thickness – the Pro has an extra 4.2mm to accommodate (among other things) an Intel Core i5 processor, just like you’d find on a good laptop or desktop PC. So it has a perfectly normal version of Windows 8 for its operating system and can run all traditional Windows programs. In many ways this incarnation of Surface is simply a reboot of the slate-style Tablet PC, such as those made by Motion. Except of course that it also has WinRT, and so can run just the same apps as the ARM version in just the same Metro touch interface. This then is the key idea: WinRT works on both the Intel hardware architecture and on ARM. The same apps will run on tablets, laptops and desktops, no matter who makes the chips. So have you guessed? Yes, Windows Phone 8 also has WinRT. That’s why they had to rebuild it from the ground up. Before, the phone and desktop versions of Windows had been pretty much completely incompatible. From this on they will share a lot in common. The very same apps – with suitable adjustment for screen size, etc. – will run on phones as well now. Another of Microsoft’s recent flurry of announcements was SmartGlass, which helps integrate tablets and phones with the Xbox and so with your TV. The possibilities are intriguing, especially if – as I think is a completely safe prediction – WinRT comes to the Xbox as well. No one else can offer a single platform for developers like that – phones, tablets, laptops, desktops and perhaps game consoles, all running the same apps. For the first time in years, Microsoft look like a company with a vision. I foresee this failing horribly in the marketplace until Apple does the exact same things in 2015/6 and they are praised for being innovative industry leaders. Or maybe Microsoft will gain the respect it’s always deserved and I’ll be wrong. You’re right that they don’t get the respect they deserve. I think Microsoft did more – far more – than any other company to make computing affordable. They were respected once though. It’s easy to forget now, but in the late 90s they seemed like a company completely infused with genius. And it was largely their own fault that they blew that. A humbler Microsoft, facing real competition from Apple and Google, seems a better Microsoft already. It’s hard to tell at this point whether its actually a good idea. Having the same apps run on devices with wholly different form factors and interfaces is something that Apple has been careful to avoid, and which you could easily imagine going horribly wrong. But by pushing touch (and pen) to the desktop and laptop quite keenly for some time now, Microsoft have clearly been envisaging a smooth, almost stepless transition between device types and therefore a single market for software. It’s an approach that’s worked well for them before. Thanks for a great break down on this. I have a ipad with a USB keyboard to give me that laptop feel but it majes it a bit bulky. I love this cover with integrated keyboard. You might be correct, Microsoft might be pn a winner here! Well, I don’t know if this product is going to be a hit in itself. There are just too many details missing so far. (Battery life will be a huge one; I imagine they’re not too keen to talk about that yet because the stamina of the ARM and Intel versions is probably going to be markedly different.) But I like the way the strategy is forming. The most important thing for them now is to create an app market that will be attractive for developers. Too many things in the tech world are received with a disproportionate sense of anticipation these days. It’s Jack Welch’s mentality applied on every piece of coverage. It doesn’t have to be that way and it hardly ever is. What I mean is too many times a new tech development (Facebook IPO, all the tablets, all the smartphones) are evaluated on whether or not they will be the top 1 or top 2 leader in the market, often with the immediate discussion of how the company will fare in the stock market. This is a fake framing of the topic. The question is what it always was: can the company sell enough of them to make a profit? Behind that is the question “does the product offer something new others may copy?” I think in the case of the latter Microsoft have something decent here. The screen keyboards are pretty bad, in my opinion, but many users do not need an inflexible laptop keyboard sitting there all the time. I like how this blurs the line between tablets and laptops. I think we should have every possible variant of portable products that we can conceive out there. No two users are alike. If vendors can offer more products without losing profit let them all in. The sooner we are out of this winner-must-take-all mentality the better. I hope smartphones and tablets get to the point phones were before the iPhone, where no company had absolute control of the market and many of them thrived. Amen. Imagine if every new Bechstein was hailed as “the Steinway killer”. It’s the traditional narrative for technology stories, probably because of those companies – Microsoft, Google, Apple, Facebook – that have, for a while at least, utterly conquered one niche. But usually that company has pretty much invented the niche they made their own. It’s exciting when that happens. A wholly new product type becomes more than just a device. In the modern tech industry it’s also fashion, even culture. As I was saying to Phil the problem for Microsoft or anyone competing with Apple is to make it cool to develop for the platform. But – if it’s not stating the obvious – it’s better for the consumer when there’s real competition. Microsoft might be able to offer that, if they remember how to be interesting. Next PostNext Free Comedy Gigs Versus The Banking Industry!